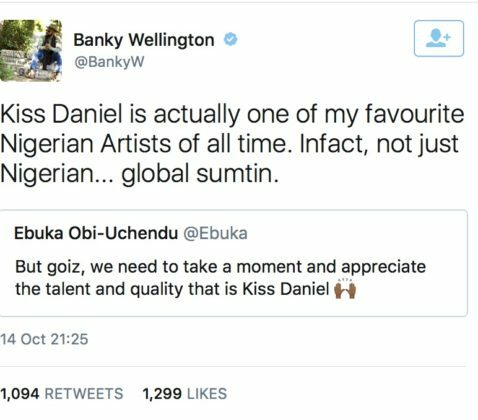 Banky W & Ebuka Uchendu Drops Praises On Kiss Daniel. The G-worldwide artiste Kiss Daniel had a major endorsement from RnB artiste Bank W yesterday. Kiss Daniel who is definitely in a league of his own has been receiving nationwide positive reviews after his song “Yeba” was released. See screenshot of the post below. Yesterday, in an interview with Sunday Scoop, Kiss Daniel reiterated his commitment to music, saying he wasn’t quitting music for comedy yet. The singer, who recently showed his comedy side by dropping skits on social media, has opened up on this talent making it known that despite enjoying his comedy side, he has no plans of leaving music for it. “I have no plans to delve into comedy; music is my major talent. If you listen to my new song, Yeba, you would notice that there are traces of comedy in it. You would also note that I started uploading those comedy skits about a month before Yeba was released, so it was just a strategy to promote the song. It was a means of creating awareness,” he said.